In just a few days we’re going to hold a hackathon in Minsk, which will also be broadcasted live by Imaguru for Spanish audience. It will be held from the 5th to 7th October as a part of the Imaguru Startup Hub event. In addition to that, we are going to organize two open workshops from October 1st to 4th as a part of the Imaguru Blockchain Applications Development School.With a growing interest in the development of blockchain games, we are looking forward to showcasing our expertise at the Minsk hackathon in the coming days. 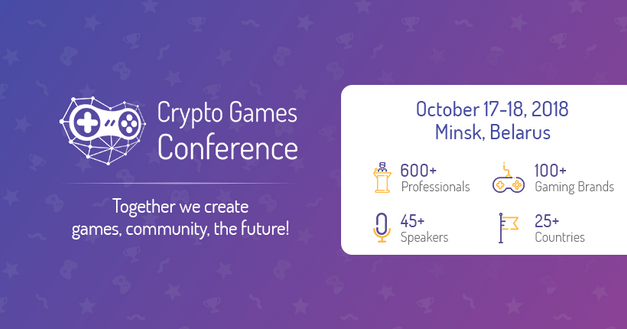 Two weeks after the hackathon, we will once again talk about the future of the industry and our SDK at the Crypto Games Conference, the world's first event dedicated to blockchain games and game services, that will be held in Minsk on October 17th and 18th. Crypto Games Conference is one of the biggest events that brings together hundreds of experts and developers - more than 600 industry professionals, 45+ speakers and over 25 brands are expected to be present at the conference to discuss the future of the industry, pitch their project and share their expertise. We're proud to announce that our CMO, Dmitry Belianin, will take part in two panel discussions on the second day of the conference. The topic of the first discussion, taking place from 12 to 13 local time, will be "iGaming + Blockchain. What does it mean for the market?". The second 45-minute long panel discussion - "Marketing Challenges Which Crypto Gaming Companies are Facing" - is scheduled for 17.45. During the event our team will organize a workshop for developers, where we will reveal game demos developed with the use of our protocol, as well as introduce developers to the basics of game development with the use of our SDK. The team will invite developers, both from large studios and independent teams, to take part in our Sandbox. It is specifically designed to assist developers in the process of creating and publishing games on our ecosystem. To purchase tickets and find out more about Crypto Games Conference, please visit the official site here. Next up, we’re moving to another blockchain and iGaming tech hub - Malta, to make an appearance at the Malta Blockchain Summit - open to the public between November 1st up to 2nd. For us, it will be the second hackathon of the season. Our goal is to continue optimizing our protocol, considering all the valuable feedback from developers, constantly using it to improve our SDK. For more details on the Malta Blockchain Summit and to purchase tickets, check out their official site. Last but not least, mark November 28th-30th on your calendar, as we’re going to the epic Malta Gaming Week event! Given the strong iGaming presence in this region, we couldn’t miss out on the opportunity to demonstrate our progress at the biggest stage in the industry. The DAO.Casino team will hold its third hackathon in the fall and will attend the Malta Gaming Awards dinner ceremony, where the best developers of blockchain games will be honored with awards (fingers crossed!). We are preparing something special for Malta Gaming Week and will tell you the details closer to the beginning of the event. Dmitry Belianin, CMO at DAO.Casino, explains the importance of dates like these for both the company and the industry as a whole: "Every offline event is a way to personally showcase our product and share our vision and philosophy with professionals from the online gambling industry. DAO.Casino is working not just to change the rules of the game, but to build a new iGaming industry regulated by technology. Hackathons and exhibitions are another step towards achieving this goal. See you at the events!". The hackathon will last from October 6th to 8th and will be broadcasted to Spain.✨We are excited to take part in the Minsk #hackathon organized in collaboration with @Imaguruby #blockchainathon #Minsk pic.